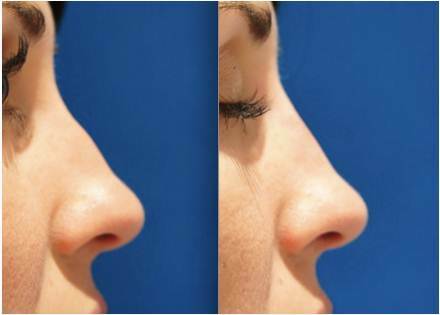 Nose filler, AKA non-surgical nose jobis a popular treatment for noses at our Sydney clinic. The nose could be considered the “anchor” of the face, because it plays such an important part of the level of attractiveness. 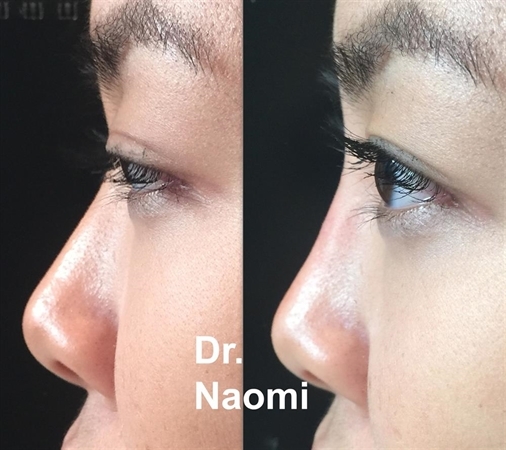 Common nose issues that we see and treat at our clinic are asian nose bridge lifting, disguising humps, lifting nose tips and fixing asymmetries or defects after surgical rhinoplasties. 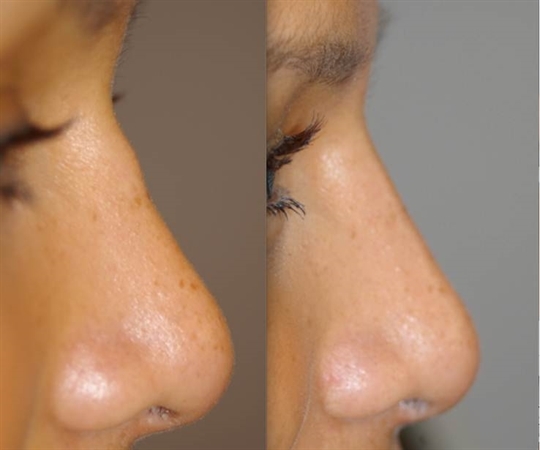 There are many areas on the nose that can benefit from injections. Please see below all of the options for improving noses. Some people were born with great noses, and others were born with noses whose appearance could be improved. 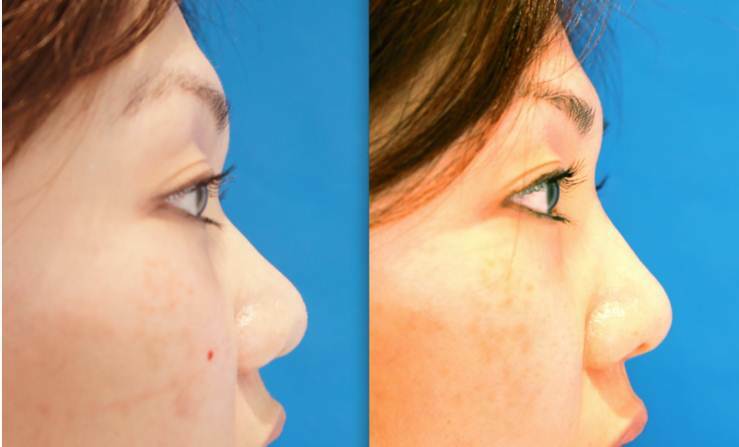 For those who weren’t born with the perfect nose, a non-surgical nose job can be used to improve the appearance. The patient will be assessed and the doctor will have a discussion with the patient about their anatomy, and how it can be improved. 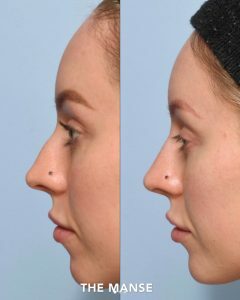 may be improved.The projection of any areas of the nose from the radix through the dorsum and the tip can be improved. 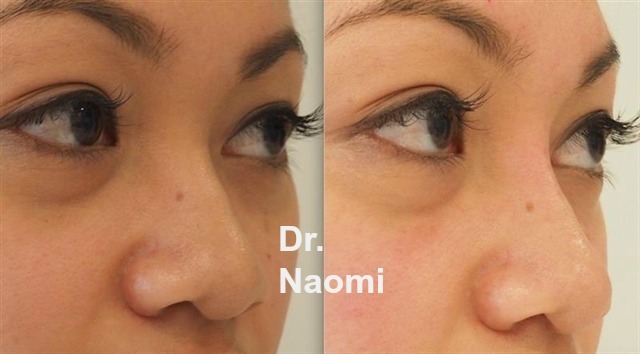 Asymmetry of the nose is very common, and can be improved with dermal filler treatment. 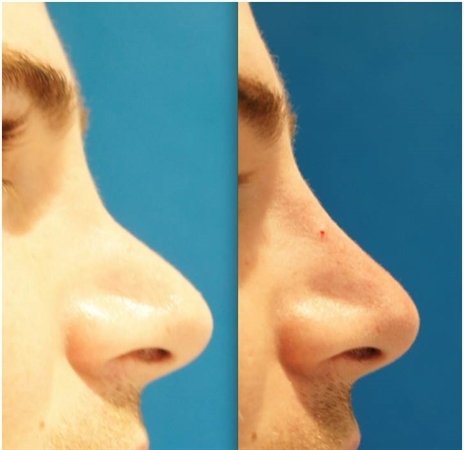 The dose required for nose filler is variable, but the typical procedure would be for 3 treatments 1 month minimum apart, to get to the best result. At our clinic only supply 1ml syringes. No more than 1ml would be used in a treatment. Mostly less than 1ml will be used. Your doctor will assess the face and decide on the best dose after taking a history and examining the patient. 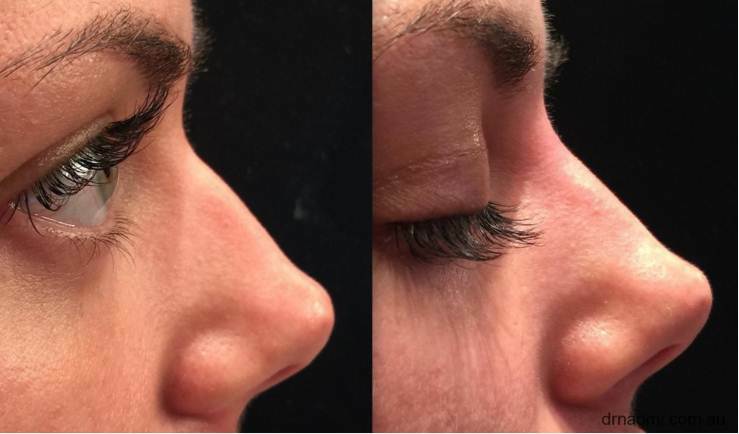 If a patient has a history of complications with dermal fillers, or if their budget is small or if they want a more subtle result, then a smaller dose might be chosen to start with. 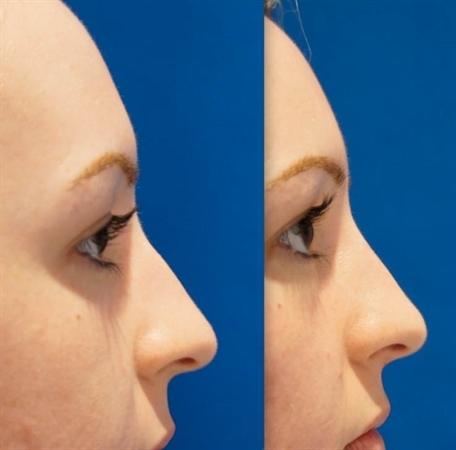 What happens during the nose filler treatment? Ice will be applied prior to treatment. The doctor may inject using a very fine needle. Pressure with gauze will be applied to minimise bruising. Necrosis (blood vessel being blocked, interfering with blood supply to the skin) is very rare. This could lead to scarring. Unfortunately the nose is more susceptible to this complication than other areas on the face eg cheeks and chin. Need for further treatment: Often with noses, it will take several syringes of product to get to where the patient wants to be. No. No need to call the doctor. 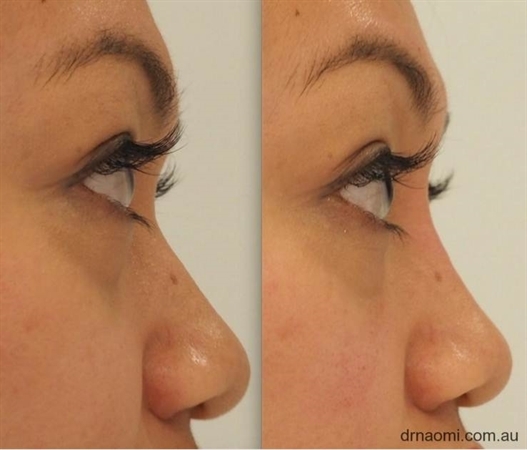 Sometimes asymmetry will occur because one side is more swollen or bruised. Usually it will right itself by the time of the review appointment. If it doesn’t, then it can be examined at the review appointment at 4 weeks. There is no point in coming in early for treatment of asymmetry as there is often swelling associated and so the final result cannot be seen until at least 4 weeks. 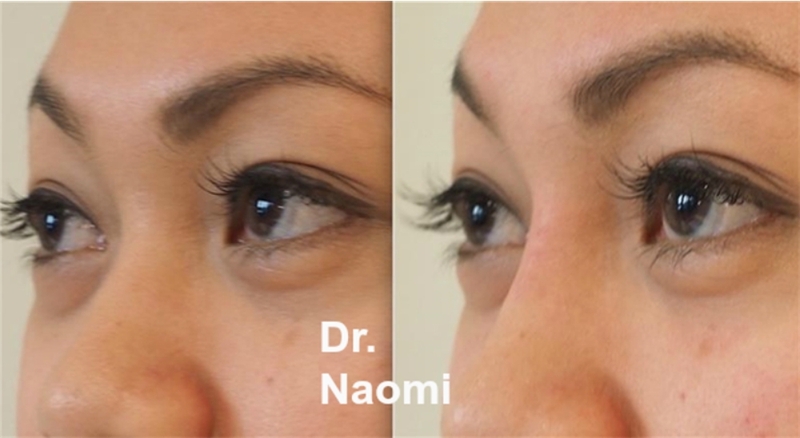 Treating asymmetry too early could lead to further asymmetry.